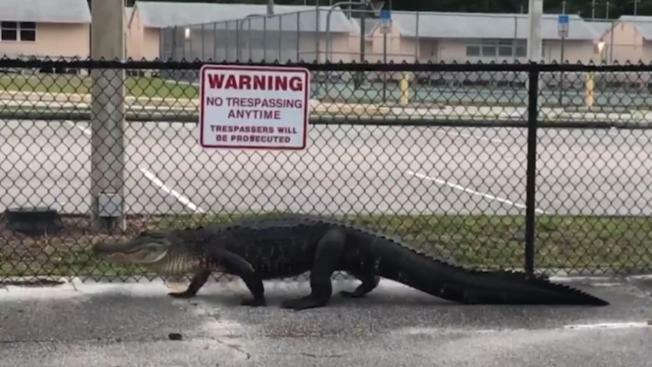 An alligator out for a Sunday stroll brought traffic to a halt outside a Deltona, Florida, middle school this weekend. Karl Miranda told NBC affiliate WESH he drives by Deltona Middle School regularly on his way to work and was surprised to hit traffic on that road on a Sunday evening. At first, Miranda wasn’t sure why cars were slowing down, but as he got closer, he told WESH, he saw something "huge and murky" sauntering down the sidewalk. "As I got closer, I saw it was a gator, and the closer I got, it was a big gator," Miranda said. An alligator out for a Sunday stroll brought traffic to a halt outside of a Deltona, Florida, school. Karl Miranda captured video of the "huge" gator lumbering past Deltona Middle School Sunday evening. Florida Wildlife Conservation Commission officials said Tuesday a trapper responded to the scene Sunday night but did not find the approximate 8-foot gator anywhere on the property. Volusia County Animal Control officers walked the school grounds Monday morning before classes began and did not see signs of the alligator. The school is near several bodies of water indigenous to wildlife, including alligators, according to WESH.